Psoriatic arthritis (PA) is a specific type of arthritis that has been diagnosed in approximately 23% of those who have psoriasis. PA can occur in any age group; however, in most patients, it manifests itself between 30 and 50 years of age. On average, PA appears about 10 years after the first signs of psoriasis occur, but in about 1 of 7 people with PA, arthritis symptoms occur before any skin lesions appear. Most patients with PA also have psoriasis; patients rarely have PA without psoriasis. A haplotype epidemiologic association with PA involves the expression of both class I and class II human leukocyte antigen (HLA) alleles, including HLA-B13, HLA-B17, HLA-B27, HLA-B38, HLA-B39, HLA-Cw6, HLA-DR4, and HLA-DR7. HLA-B27 is present in 60% of individuals with the disease, as compared with 8% of the general population. Arthritis of the sacroiliac joints and spine (psoriatic spondylitis) — 5-33%. For patient education resources, see the Skin Conditions & Beauty Center, as well as Types of Psoriasis, Psoriatic Arthritis, and Psoriasis Medications. No or minimal juxta-articular osteoporosis: In RA, this is more prominent. Bony proliferation near joints and ligament and/or tendon insertion sites (ie, entheses): Enthesis sites include the calcaneus, ischial tuberosities, femoral trochanters, ankle malleoli, anterior patella, ulnar olecranon, and condyles of the distal femur and proximal tibia. This is not a feature of RA. Bone erosion beginning in the periarticular region and progressing to more central areas. Asymmetrical destruction of the DIP with bony ankylosis: RA affects the metacarpal phalangeal joint and proximal interphalangeal joint [PIP] to a greater extent. Destruction/resorption of the interphalangeal joint of the first toe, with periosteal reaction and bony proliferation at the distal phalangeal base: This finding is highly suggestive of PA. In the paper “Predictors for radiological damage in psoriatic arthritis: results from a single centre,” Bond et al concluded that the number of actively inflamed joints — specifically, the number of swollen joints — could be predictive of damage progression, as visualized radiologically. A higher risk of damage progression was related to a higher number of previously inflamed and damaged joints. Asymmetrical paravertebral ossification from the lower thoracic spine to the upper lumbar spine: This may be vertically directed and may not always be attached to the vertical margins, as in ankylosing spondylitis. Bony proliferation along anterior cervical spine and apophyseal joint-space narrowing. Squaring of the lumbar vertebrae in L-spine: This occurs in ankylosing spondylitis but is uncommon in PA.
Synovitis: This may cause atlantoaxial subluxation in a few patients. Widening of the joint margin and sclerosis: This is less common in PA than in ankylosing spondylitis. Anteroposterior radiograph of the abdomen shows fusion of the sacroiliac joints. Courtesy of Bruce M. Rothschild, MD. Anteroposterior radiograph of the hands shows subchondral erosions of the fourth left distal interphalangeal joint and right third and fourth proximal interphalangeal joints with periosteal reaction. Courtesy of Bruce M. Rothschild, MD. 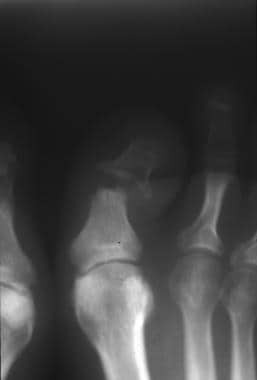 Anteroposterior radiograph of the feet shows arthritis mutilans. Courtesy of Bruce M. Rothschild, MD. 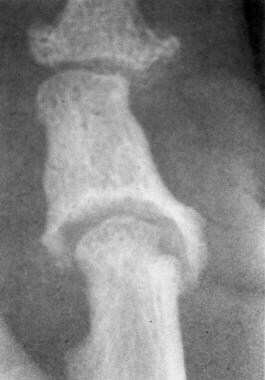 Anteroposterior radiograph of the thumb shows arthritis mutilans. Courtesy of Bruce M. Rothschild, MD. 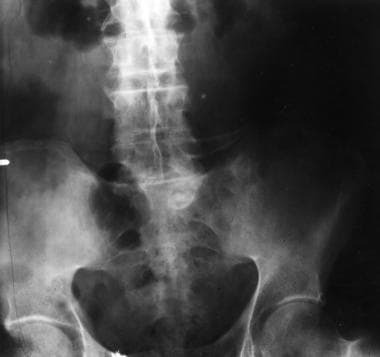 Anteroposterior radiograph of the pelvis in a male patient shows sacroiliitis in association with psoriasis. Courtesy of Ali Nawaz Khan, MBBS. Left, lateral radiograph of the dorsal spine of a 38-year-old man shows spondylitis in association with psoriasis. Note the squaring of the anterior vertebral bodies. 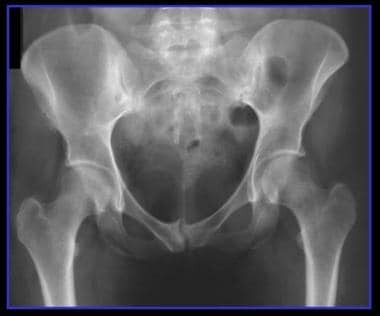 Right, radiograph of the pelvis in the same patient shows sacroiliitis and erosive changes around both hip joints. Courtesy of Ali Nawaz Khan, MBBS. 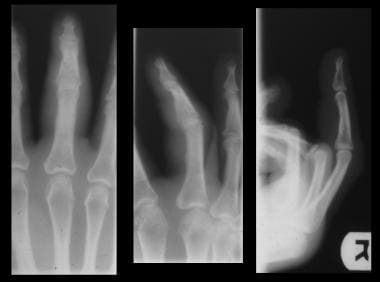 Radiograph views of the fourth finger show diffuse soft tissue swelling. This is a nonspecific finding and can also be seen in rheumatoid arthritis, scleroderma, lupus, Reuter syndrome, gout, and infection. Courtesy of Michael R. Aiello, MD. Radiograph showing extensive bony destruction around the interphalangeal joint of the second toe. There is associated widening of the joint space, which helps distinguish this condition from osteoarthritis. The base of the middle phalanx is expanded, and there is diffuse soft-tissue swelling but no osteoporosis. Marked osseous erosion about the joint has produced a characteristic pencil-in-cup deformity. Courtesy of Michael R. Aiello, MD. A pattern of predominant DIP involvement can distinguish PA from RA. In the axial skeleton, cervical spinal involvement can be prominent in RA, but thoracic and lumbar changes are unusual. 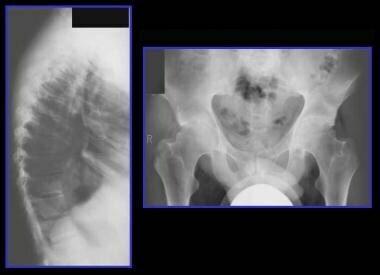 Sacroiliac involvement is a minor feature of RA, but large joints are more involved in RA than in PA.
PA maintains bone mineralization and has periosteal reaction and new-bone formation. PA is RF negative, whereas RA is RF positive. PA does not manifest with rheumatoid nodules. Sausage digit and spontaneous joint fusion are common in PA and Reiter syndrome but not in RA. A study by Sandobal et al suggested that ultrasound helps distinguish RA from PA because of differences in the ventral nail plate. Sandobal et al found significant differences, measured by ultrasound (P< 0.0001), of the mean distance ventral plate-osseous margin of the distal phalanx in psoriatic arthritis patients (P=0.001), in patients with cutaneous psoriasis (P=0.005), and in rheumatoid arthritis patients (P=0.548). The distinction between PA and other seronegative spondyloarthropathies is largely made on the basis of distribution. PA involves both the upper and lower extremities, whereas Reiter syndrome predominantly involves the lower extremities. Ankylosing spondylitis causes changes mainly in the axial skeleton, with bilateral and symmetrical changes being the rule. The spinal bony excrescences of PA and Reiter syndrome are larger and broader than the typical thin, linear syndesmophytes of ankylosing spondylitis. Although plain radiography is the primary modality in assessing PA, computed tomography (CT) is the gold standard for evaluating bone changes in arthritis and can provide further information about the extent and severity of disease. This is particularly true in areas that are difficult to evaluate with radiographs, such as the sacroiliac joint, the temporomandibular joint, and the sternum/manubrium. CT scanning is particularly useful in identifying inflammatory lesions, even when preexisting degenerative disease is present; in demonstrating the articular surfaces of bone in an exact fashion; and, in some cases of sacroiliitis, in clearly demonstrating erosive changes that can appear equivocal or negative on radiography. The drawbacks of CT are that it is unable to detect active inflammatory lesions and involves ionizing radiation  . Computed tomography (CT) scans of the pelvis in a male patient with sacroiliitis in association with psoriasis. The CT scans show subtle changes of sacroiliitis more clearly than do conventional radiographs. Courtesy of Ali Nawaz Khan, MBBS. Offidani et al compared the use of MRI with the use of standard radiographs in the evaluation of patients with PA.  With MRI, 68% of patients had positive findings of PA, as well as at least 1 arthritic sign. In contrast, with standard radiographs, only 32% of the same patients had positive findings of PA. In a high percentage of psoriatic patients who had no apparent arthritic signs and symptoms, MRIs revealed hand articular involvement, particularly distention of the capsule and periarticular edema. In patients with PA, MRIs of the temporomandibular joint can show slight anterior displacement of the disc, as well as large condylar erosions and joint effusion, either with or without the use of contrast agents. Thickened nails with low signal intensity on T1-weighted images are typical findings of nail involvement. MRI can show the underlying histopathologic changes of edematous and/or fibrotic synovial tissue, which can cause erosions of cortical bone and can eventually lead to complete destruction of the joint. The terminal tuft may show edema and enhancement with psoriatic involvement of the nail bed. Morrison et al summarized psoriatic findings in the ankle and foot. The sausage digit is a typical clinical finding in PA and can be seen as diffuse soft tissue edema of the digits. Tenosynovitis, an increase in fluid in the tendon sheath, as well as enhancement related to synovial proliferation, may be seen. Enthesis inflammation manifests itself as plantar fasciitis, with edema and enhancement of the proximal plantar fascia and the adjacent calcaneus. Reactive edema in the adjacent tissue beneath the tendon is linked to involvement of the tendon sheath. Effusions and synovial proliferation can be seen as a result of joint involvement. Synovial proliferation within joints is seen as "dirty fluid" on T2-weighted images. Inflamed synovial tissue is strongly enhancing on gadolinium-enhanced images. Chronic synovial proliferation can demonstrate a high T1 signal, representing hyperplasia of subsynovial fibrofatty connective tissue without a pannus. The bursae may demonstrate fluid and enhancing synovial tissue; this is true for the anatomic bursae—in particular, the retrocalcaneal bursa and the adventitial bursa—as a result of friction. McQueen et al described the initial steps in forming an Outcome Measures in Rheumatology (OMERACT) MRI scoring system for peripheral PA. [40, 41] Four readers scored a preexisting MRI dataset (finger joints) from 10 patients with peripheral PA. Bone erosion, bone edema, synovitis, tendinopathy, and extracapsular features of inflammation (including enthesitis) were assessed. The results demonstrated that bone edema and erosion showed moderate to high scoring reliability and that soft tissue inflammation showed a lower scoring reliability. Healy et al assessed 17 patients with psoriatic dactylitis who underwent a change of treatment, usually to methotrexate. MRI scans of the affected hand or foot were performed before and after treatment, and MRI images demonstrated widespread abnormalities in the digits of patients with PA. Improvement was seen after treatment; however, there was not a close relationship between the extent of abnormalities seen on MRI and any of the clinical indices of dactylitis. Ultrasonography (US) is useful for assessing extent of disease, identifying inflammatory changes, monitoring treatment, and guiding intra-articular steroid interventions. 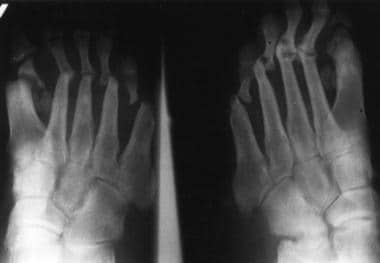 [17, 29, 36, 44] US is also considered a highly specific technique for visualizing bone abnormalities, especially in the examination of the small joints. In addition, US can aid in the differential diagnosis, such as helping to distinguish RA from PA by differences in the nail ventral plate. The European League Against Rheumatism (EULAR) has endorsed the use of US in early diagnosis of enthesitis, peripheral arthritis, tenosynovitis, and bursitis. US examinations are performed using B-mode US, most often in combination with color or power Doppler ultrasound. In PA, joint effusion and synovitis result in hypoechoic sonograms in which the joint space is widened. In some cases, a pseudocystic image connected with the joint space can be observed. Increased thickness of the joint capsule can also be present. The joint capsule is usually clearly distinct from the condylar head, which appears as a linear hyperechoic line with posterior shadowing. The nail can be demonstrated as an apparent bilayer on US, with obliteration of the bilayer with onychopathy of psoriasis. In a cross-sectional study of 141 PA outpatients  , the power Doppler global score and the gray-scale entheses score were both found to be higher in patients with active disease than in patients with inactive disease. Fournie et al prospectively compared power Doppler ultrasound findings in 25 fingers of patients who had RA with findings in 25 fingers of patients who had PA and found that in both RA and PA, patients had erosive synovitis and tenosynovitis. Extrasynovial changes such as enthesitis occurred in 21 of 25 patients (84%) with PA, whereas no patients with RA had extrasynovial changes. The main patterns of extrasynovial changes were capsular enthesophytes, juxta-articular periosteal reaction, enthesopathy at the site of deep flexor tendon insertion on the distal phalanx, subcutaneous soft tissue thickening of the finger pad, subcutaneous soft tissue thickening of the entire finger, and pseudotenosynovitis. Of the 21 patients with PA whose fingers showed extrasynovial changes, synovial changes were apparent in 60%. Bone scanning is a useful technique for assessing the inflammatory nature and extent of PA. Whole-body scintigraphy shows the distribution of active joint disease, and abnormal radiotracer uptake precedes findings on plain radiographs. Bone scanning is highly sensitive but not specific; bone scans may show that inflammation exists, but a positive finding is not diagnostic of PA and must be correlated with clinical findings. Enthesopathies may be readily detected on bone scans and show hyperactive foci. This is the case when technetium-99m (99mTc) bisphosphonate bone scans are centered on the chest wall, where the jugular notch, costal notches, and xiphoid are most commonly involved. Enthesopathy manifests itself with a radiologic triad: hyperostosis, osteitis, and periostitis syndrome. Other types of inflammatory arthritis, as well as infection and trauma, can sometimes mimic PA when a bone scan is used. Tc-99m phosphate scans show the location and distribution of active lesions. Scintigraphy enables the inexpensive and simple assessment of joints in the body, but the anatomic detail is poor and the specificity is low. Alamanos Y, Voulgari PV, Drosos AA. Incidence and Prevalence of Psoriatic Arthritis: A Systematic Review. J Rheumatol. 2008 May 1. [Medline]. Kaeley GS, Eder L, Aydin SZ, Gutierrez M, Bakewell C. Dactylitis: A hallmark of psoriatic arthritis. Semin Arthritis Rheum. 2018 Oct. 48 (2):263-273. [Medline]. [Full Text]. [Guideline] Gossec L, Smolen JS, Ramiro S, et al. European League Against Rheumatism (EULAR) recommendations for the management of psoriatic arthritis with pharmacological therapies: 2015 update. Ann Rheum Dis. 2016 Mar. 75 (3):499-510. [Medline]. [Guideline] Coates LC, Tillett W, Chandler D, et al. The 2012 BSR and BHPR guideline for the treatment of psoriatic arthritis with biologics. Rheumatology (Oxford). 2013 Oct. 52 (10):1754-7. [Medline]. [Guideline] Gottlieb A, Korman NJ, et al. Guidelines of care for the management of psoriasis and psoriatic arthritis: Section 2. Psoriatic arthritis: overview and guidelines of care for treatment with an emphasis on the biologics. J Am Acad Dermatol. 2008 May. 58 (5):851-64. [Medline]. Luong AA, Salonen DC. Imaging of the seronegative spondyloarthropathies. Curr Rheumatol Rep. 2000 Aug. 2(4):288-96. [Medline]. Ory PA, Gladman DD, Mease PJ. Psoriatic arthritis and imaging. Ann Rheum Dis. 2005 Mar. 64 (suppl 2):ii55-7. [Medline]. [Full Text]. Guglielmi G, Scalzo G, Cascavilla A, Salaffi F, Grassi W. Imaging of the seronegative anterior chest wall (ACW) syndromes. Clin Rheumatol. 2008 Jul. 27(7):815-21. [Medline]. Azouz EM, Duffy CM. Juvenile spondyloarthropathies: clinical manifestations and medical imaging. Skeletal Radiol. 1995 Aug. 24(6):399-408. Salaffi F, Carotti M, Beci G, Di Carlo M, Giovagnoni A. Radiographic scoring methods in rheumatoid arthritis and psoriatic arthritis. Radiol Med. 2019 Feb 9. [Medline]. [Guideline] Singh JA, Guyatt G, Ogdie A, et al. Special Article: 2018 American College of Rheumatology/National Psoriasis Foundation Guideline for the Treatment of Psoriatic Arthritis. Arthritis Rheumatol. 2019 Jan. 71 (1):5-32. [Medline]. Zabotti A, Mandl P, Zampogna G, Dejaco C, Iagnocco A. One year in review 2018: ultrasonography in rheumatoid arthritis and psoriatic arthritis. Clin Exp Rheumatol. 2018 Jul-Aug. 36 (4):519-525. [Medline]. [Full Text]. Queiro R, Tejon P, Alonso S, Alperi M, Ballina J. Erosive discovertebral lesion (Andersson lesion) as the first sign of disease in axial psoriatic arthritis. Scand J Rheumatol. 2013 Jan 14. [Medline]. Coates LC, Helliwell PS. Psoriatic arthritis: state of the art review. Clin Med (Lond). 2017 Feb. 17 (1):65-70. [Medline]. Sanyal K, Stuart B. Osteopoikilosis: spotted bone disease in a patient with psoriatic arthritis. J Clin Rheumatol. 2010 Aug. 16(5):251. [Medline]. Marchesoni A, De Marco G, Merashli M, McKenna F, Tinazzi I, Marzo-Ortega H, et al. The problem in differentiation between psoriatic-related polyenthesitis and fibromyalgia. Rheumatology (Oxford). 2018 Jan 1. 57 (1):32-40. [Medline]. [Full Text]. Poggenborg RP, Østergaard M, Terslev L. Imaging in Psoriatic Arthritis. Rheum Dis Clin North Am. 2015 Nov. 41 (4):593-613. [Medline]. Candia L, Cuellar ML, Marlowe SM, Marquez J, Iglesias A, Espinoza LR. Charcot-like arthropathy: a newly-recognized subset of psoriatic arthritis. Clin Exp Rheumatol. 2006 Mar-Apr. 24(2):172-5. Bond SJ, Farewell VT, Schentag CT, Gladman DD. Predictors for radiological damage in psoriatic arthritis: results from a single centre. Ann Rheum Dis. 2007 Mar. 66(3):370-6. Ozcakar L, Cetin A, Inanici F, Kaymak B, Gurer CK, Kolemen F. Ultrasonographical evaluation of the Achilles' tendon in psoriasis patients. Int J Dermatol. 2005 Nov. 44(11):930-2. Mullan RH, Matthews C, Bresnihan B, FitzGerald O, King L, Poole AR, et al. Early changes in serum type II collagen biomarkers predict radiographic progression at one year in inflammatory arthritis patients after biologic therapy. Arthritis Rheum. 2007 Sep. 56(9):2919-28. [Medline]. Sandobal C, Carbo E, Iribas J, Roverano S, Paira S. Ultrasound nail imaging on patients with psoriasis and psoriatic arthritis compared with rheumatoid arthritis and control subjects. J Clin Rheumatol. 2014 Jan. 20(1):21-4. [Medline]. Fournie B, Margarit-Coll N, Champetier de Ribes TL, et al. Extrasynovial ultrasound abnormalities in the psoriatic finger. Prospective comparative power-doppler study versus rheumatoid arthritis. Joint Bone Spine. 2006 Oct. 73(5):527-31. Poggenborg RP, Eshed I, Ostergaard M, Sorensen IJ, Moller JM, Madsen OR, et al. Enthesitis in patients with psoriatic arthritis, axial spondyloarthritis and healthy subjects assessed by 'head-to-toe' whole-body MRI and clinical examination. Ann Rheum Dis. Jan 2014. [Medline]. Mejjad O, Daragon A, Louvel JP, et al. Osteoarticular manifestations of pustulosis palmaris et plantaris and of psoriasis: two distinct entities. Ann Rheum Dis. 1996 Mar. 55(3):177-80. [Medline]. [Full Text]. Louvel JP, Duvey A, Da Silva F, Primard E, Mejjad O, Henry J. Computed tomography of sternoclavicular joint lesions in spondylarthropathies. Skeletal Radiol. 1997 Jul. 26(7):419-23. Yuan Z, Ieong FH, Jiang H, Sobel ES. Osteoarthritis and psoriatic arthritis: findings in three-dimensional biophotonics imaging. Biomed Mater Eng 2014. 2014. 24(6):3063-71. [Medline]. Fukuda T, Umezawa Y, Tojo S, Yonenaga T, Asahina A, Nakagawa H, et al. Initial Experience of Using Dual-Energy CT with an Iodine Overlay Image for Hand Psoriatic Arthritis: Comparison Study with Contrast-enhanced MR Imaging. Radiology. 2017 Jul. 284 (1):134-142. [Medline]. D'Angelo S, Palazzi C, Gilio M, Leccese P, Padula A, Olivieri I. Improvements in diagnostic tools for early detection of psoriatic arthritis. Expert Rev Clin Immunol. 2016 Nov. 12 (11):1209-1215. [Medline]. Ostergaard M, McQueen F, Bird P, et al. The OMERACT Magnetic Resonance Imaging Inflammatory Arthritis Group - advances and priorities. J Rheumatol. 2007 Apr. 34(4):852-3. [Medline]. Van der Heijde D, Sharp J, Wassenberg S, Gladman DD. Psoriatic arthritis imaging: a review of scoring methods. Ann Rheum Dis. 2005 Mar. 64 (suppl 2):ii61-4. [Medline]. [Full Text]. Weishaupt D, Schweitzer ME, Alam F, Karasick D, Wapner K. MR imaging of inflammatory joint diseases of the foot and ankle. Skeletal Radiol. 1999 Dec. 28(12):663-9. [Medline]. McQueen F, Lassere M, Bird P, Haavardsholm EA, Peterfy C, Conaghan PG, et al. Developing a magnetic resonance imaging scoring system for peripheral psoriatic arthritis. J Rheumatol. 2007 Apr. 34(4):859-61. [Medline]. Ai Lyn Tan, Eiji Fukuba, Nicola Ann Halliday, Steven F Tanner, Paul Emery, Dennis McGonagle. High-resolution MRI assessment of dactylitis in psoriatic arthritis shows flexor tendon pulley and sheath-related enthesitis. Ann Rheum Dis. 2015 January. 74(1):185–189. [Medline]. Maldonado-Ficco H, Sheane BJ, Thavaneswaran A, Chandran V, Gladman DD. Magnetic Resonance Imaging in Psoriatic Arthritis: A Descriptive Study of Indications, Features and Effect on Treatment Change. J Clin Rheumatol. 2017 Aug. 23 (5):243-245. [Medline]. Mathew AJ, Coates LC, Danda D, Conaghan PG. Psoriatic arthritis: lessons from imaging studies and implications for therapy. Expert Rev Clin Immunol. 2017 Feb. 13 (2):133-142. [Medline]. Offidani A, Cellini A, Valeri G, Giovagnoni A. Subclinical joint involvement in psoriasis: magnetic resonance imaging and X-ray findings. Acta Derm Venereol. 1998 Nov. 78(6):463-5. Østergaard M, Eder L, Christiansen SN, Kaeley GS. Imaging in the diagnosis and management of peripheral psoriatic arthritis-The clinical utility of magnetic resonance imaging and ultrasonography. Best Pract Res Clin Rheumatol. 2016 Aug. 30 (4):624-637. [Medline]. Morrison WB, Ledermann HP, Schweitzer ME. MR imaging of inflammatory conditions of the ankle and foot. Magn Reson Imaging Clin N Am. 2001 Aug. 9(3):615-37, xi-xii. McQueen F, Lassere M, Bird P, et al. Developing a magnetic resonance imaging scoring system for peripheral psoriatic arthritis. J Rheumatol. 2007 Apr. 34(4):859-61. [Medline]. McQueen F, Lassere M, Ostergaard M. Magnetic resonance imaging in psoriatic arthritis: a review of the literature. Arthritis Res Ther. 2006. 8(2):207. [Full Text]. Healy PJ, Groves C, Chandramohan M, Helliwell PS. MRI changes in psoriatic dactylitis--extent of pathology, relationship to tenderness and correlation with clinical indices. Rheumatology (Oxford). 2008 Jan;47(1):92-5. Marzo-Ortega H, McGonagle D, Rhodes LA, Tan AL, Conaghan PG, O'Connor P, et al. Efficacy of infliximab on MRI-determined bone oedema in psoriatic arthritis. Ann Rheum Dis. 2007 Jun. 66(6):778-81. [Medline]. [Full Text]. Zabotti A, Bandinelli F, Batticciotto A, Scirè CA, Iagnocco A, Sakellariou G, et al. Musculoskeletal ultrasonography for psoriatic arthritis and psoriasis patients: a systematic literature review. Rheumatology (Oxford). 2017 Sep 1. 56 (9):1518-1532. [Medline]. Michelsen B, Diamantopoulos AP, Hammer HB, Soldal DM, Kavanaugh A, Haugeberg G. Ultrasonographic evaluation in psoriatic arthritis is of major importance in evaluating disease activity. Ann Rheum Dis. 2016 Dec. 75 (12):2108-2113. [Medline]. Kane D, Greaney T, Bresnihan B, Gibney R, FitzGerald O. Ultrasonography in the diagnosis and management of psoriatic dactylitis. J Rheumatol. 1999 Aug. 26(8):1746-51. [Medline]. Freyschmidt J, Sternberg A. The bullhead sign: scintigraphic pattern of sternocostoclavicular hyperostosis and pustulotic arthroosteitis. Eur Radiol. 1998. 8(5):807-12. Ismail E, Capo A, Amerio P, Merla A. Functional-thermoregulatory model for the differential diagnosis of psoriatic arthritis. Biomed Eng Online. 2014 Dec 11. 13(1):162. [Medline]. Posteroanterior radiograph of the hands shows wrist fusion. Courtesy of Bruce M. Rothschild, MD. Lateral radiograph of the cervical spine shows posterior element fusion. Courtesy of Bruce M. Rothschild, MD. Lateral radiograph of the cervical spine shows syndesmophytes at the C2-3 and C6-7 levels with zygapophyseal joint fusion. Courtesy of Bruce M. Rothschild, MD. Anteroposterior radiograph of the lumbar spine shows nonmarginal syndesmophytes. Courtesy of Bruce M. Rothschild, MD. Anteroposterior radiograph of the pelvis shows sacroiliac joint beading/erosions. Courtesy of Bruce M. Rothschild, MD. Dorsal view of the hands shows psoriatic rash and sausage swelling on the right second finger. Courtesy of Bruce M. Rothschild, MD. Left, typical appearance of psoriasis with silvery scaling on a sharply marginated and reddened area of the skin overlying the shin. Right, thimblelike pitting of the nail plate in a 56-year-old woman who has had psoriasis for the past 23 years. Nail pitting, transverse depressions, and subungual hyperkeratosis often occur in association with psoriatic disease of the distal interphalangeal joint. Courtesy of Ali Nawaz Khan, MBBS. Radiograph of both hands (same patient as in previous image, right-side image) shows extensive erosive changes around the wrists, carpus, and metacarpophalangeal and interphalangeal joints. The patient tested negative for rheumatoid factor. Note the lack of juxta-articular osteoporosis. Courtesy of Ali Nawaz Khan, MBBS. 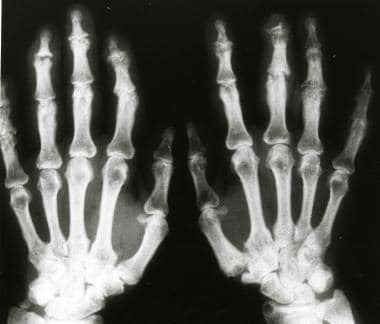 Radiograph shows an example of the pencil-in-cup deformity in the metacarpophalangeal joint: a classic psoriatic finding. Courtesy of Michael A. Bruno, MD.